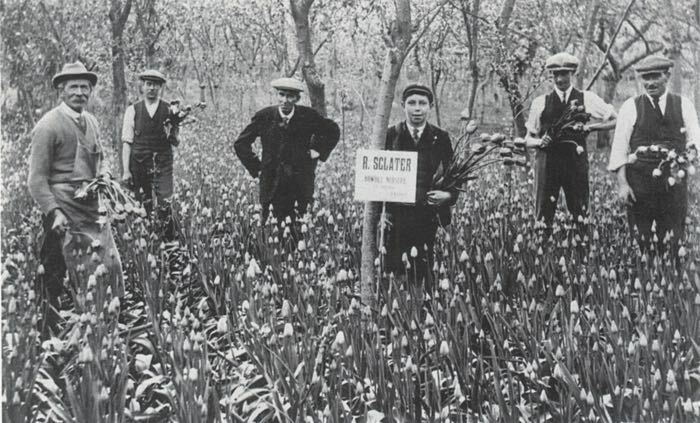 The Sclater family were nurserymen based in Exeter from the early 18th century until 2006 when the last of their nurseries was sold. Family members leased and owned land all over the city for 250 years, and will have often been in competition with each other. “TO be SOLD in FEE, and entered on at Christmas next, all that extensive and well-accustomed walled Garden, known by the name of the WARREN GARDEN, situate in Longbrook-street, in the parish of St Sidwell’s … The said garden is in a high state of cultivation, and stocked with the best fruit trees … For viewing the same apply to Mr. Sclater, the present tenant …” Flying Post August 1813. One of John’s children became head gardener to the former Exeter MP Richard Sommers Gard, at Rougemont House, and was responsible for laying out the grottos, rockeries, embankments and paths in Rougemont Gardens. From the 1770s, a cousin of William, Richard Sclater owned gardens in St David's, while James carried on his business as a nurseryman, seeds man & florist at Southernhay Gardens with his son Charles until his death in 1815. James also owned two acres of productive land adjoining the road between St Sidwells Church and Lions Holt, sold by his widow in 1822.
containing about 2 acres, situate adjoining the Road leading from St. Sidwell’s Church to Lion’s Holt, in possession of Mrs. Jane Sclater.” Flying Post May 1822." Charles, who for many years was the city councillor for St Sidwells and was behind the development of Newtown, moved to Summerlands, next to the City Workhouse, where he carried on a substantial nursery business until his death in 1872. Charles’s sons William, James & Edward started their own nurseries in various parts of the City. William Henry at Alexandra Nurseries, just opposite Summerlands in Heavitree Road, and at Exeter Nurseries in St Thomas. James at Devon Nurseries at Heavitree Bridge, and in the 1860‘s Edward Millar Divett founded the South Devon Nurseries off Haven Road in St Thomas. On the 5 July 1904, a fire broke out at South Devon House, Edward’s home, situated on the South Devon Nursery, between Alphington Road and Tan Lane. A section used for storage was gutted, but the main living area was saved. He sold the land for building and moved the business to Mount Dinham. Edward had five sons Charles, Edward, William, George and Reginald, and three daughters Ivy, Daisy and Violet. Charles, Edward and William worked in partnership at Exeter Nurseries which had previously been Lucombe & Pince. This is now known as Pince’s Gardens. They were bought by the council in 1912. By 1916 James (Reginald) had started a nursery at Ide. 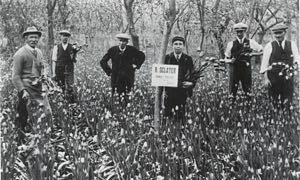 He later purchased the Bowhill Nurseries where he remained in business until his death in 1951 when his son Edward (Jack) took over the Nurseries. After WW II much of their produce was taken to be sold at markets in North Devon. Edward’s daughters stayed connected with the trade by running fruit and flower businesses. Ivy and Daisy Sclater had a shop in Bartholomew Street and Violet (Hodges) shop was in Cowick St. Violet’s daughter Iris ran a small nursery and a shop on Dunsford Hill just next to John Stocker School (now Bowhill Primary School). A nephew of Edward’s, Alec Isaacs, owned the Kings Nurseries off Union Road where the houses in Higher and Lower Kings Avenue now stand. 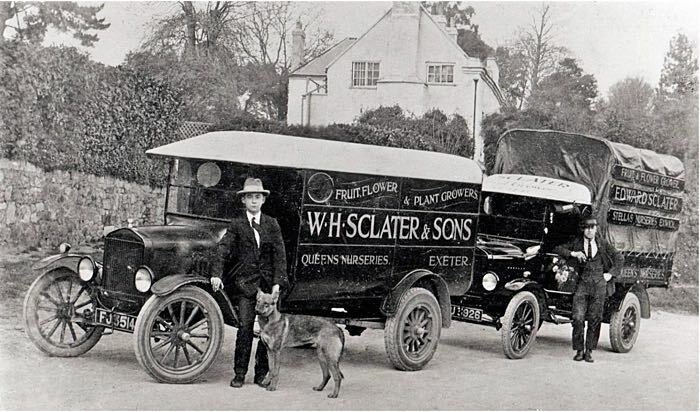 At first William worked with his father Edward but, after the fire and move to Mount Dinham, he left and went into partnership with his brothers at the Exeter Nurseries, and around 1906 he started his own business as a fruiterer and florist in Bridge Street. 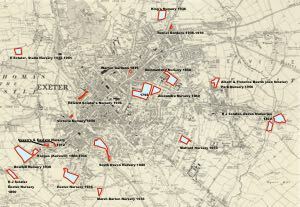 He then moved to Cowick Street and founded both Eastern and Queens Nurseries. In the 1930s he bought Flowerpot Gardens in Okehampton Street and changed the name to Victoria Nurseries. Most of his produce was sold at local markets. William’s daughters Stella and Lilian ran Eastern Nurseries until 1966, Florence and her husband owned and ran Park Nurseries in Heavitree, and Lorna ran a garden and flower stall in Exeter Market. His son Edward had Stella Nurseries off Exwick Hill (sold in the 1960s), while William jnr owned Matford Nurseries in Matford Lane, St Leonards until his death in 1954. 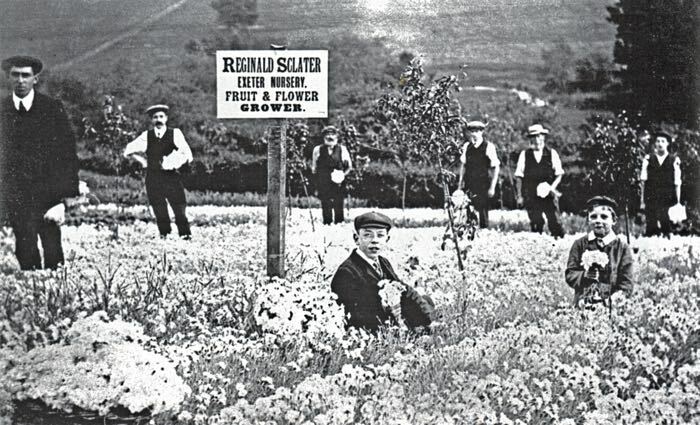 Leonard owned Marsh Barton Nurseries and later, after his brother’s death, Matford Nurseries, until his death in 1955. Peter took over Victoria Nurseries until his death in 1989, and ran them with his two sons Gerald and Roger, who carried on in the business with Gerald’s daughter Jennifer until 2006 when they sold up and retired. Most of their produce was either wholesaled from the nursery or sold at a number of markets throughout Devon. Source - Family research by Gerald Sclater and Denise Sclater, and the British Library Newspaper Archive. 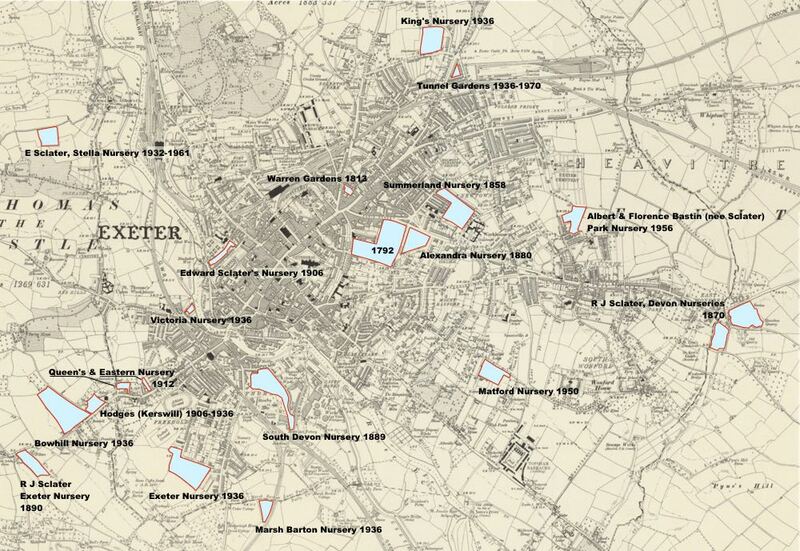 All the known Sclater gardens and nurseries around Exeter, apart from Ide. Tulips and daffodils growing in the Bowhill Nursery. Picking pinks in the R J Sclater, Exeter Nursery off Hambeer Lane. 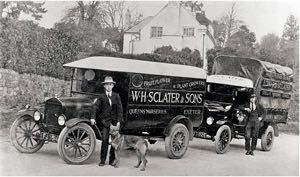 A Sclater van.